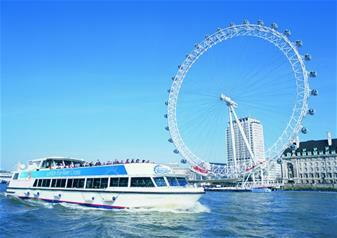 See the spectacular sights of London from the glittering River Thames with this river cruise leaving from and returning to The London Eye Pier. Offering gorgeous views of The Eye itself, as well as Tower Bridge, Big Ben, the Tower of London, the Houses of Parliament, St Paul’s Cathedral and so much more, this unforgettable cruise is an excellent way to see the city. During this 40 minute circular cruise, enjoy full commentary from a live English-speaking guide, as well as an audio guide with a language selection of French, Mandarin Chinese, German, Japanese, Spanish, Russian, Dutch and Italian.